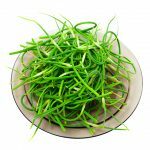 What Goes Well With Garlic Scapes? Produce: celery, garlic, mushrooms, asparagus, leafy greens, potatoes, spinach, and tomatoes. Savoury: beans, almonds, chickpeas, hummus, peanuts, pasta, rice, pine nuts, sunflower seeds, and walnuts. Garlic scapes are mildly garlicky so they go well in almost any dish! 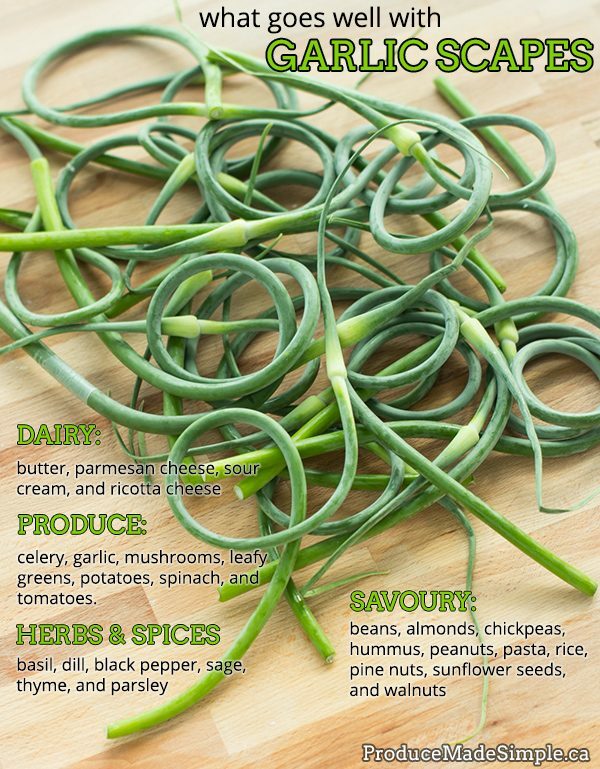 Turn garlic scapes into pesto, and use them over pasta, on flatbreads, sandwiches, pizza (and not just the dough kind! ), crackers—the sky’s the limit! Try quick-pickling tender garlic scapes for a fun accompaniment at your next BBQ. Food52 has some great ideas to use garlic scapes, including making garlic scape tempura! That sounds absolutely delicious.